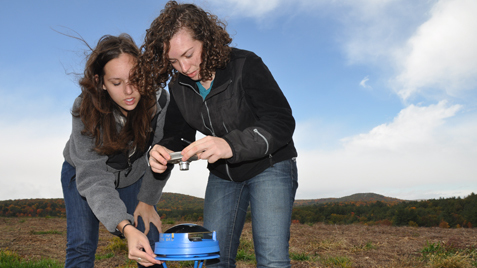 Smith engineering seniors Lindsay Holle (left) and Darcy Dwyer used the solar pathfinder to monitor the sun’s progress across the sky from day to day, month to month, before determining what kind of solar array panels would be best suited to the capped landfill location. Using photovoltaic solar panels to generate electrical power at the site of a soon-to-close landfill is a good way for the city of Northampton, Massachusetts, to capture new revenue, according to a team of Smith College engineering students. 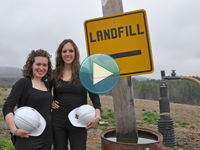 Dwyer and Holle devoted two semesters and the professional equivalent of some 1,000 hours for the research, analysis and design of a feasible renewable energy system to generate electricity at the city of Northampton’s landfill site after it closes in 2013. A solar photovoltaic system was one of three renewable energy sources the Northampton DPW asked Holle and Dwyer to research. The Smith seniors also set out to analyze the feasibility of wind or vegetation (biomass) for a potential energy system. They concluded that solar energy, harnessed through a two-axis tracking photovoltaic array, had the best potential to generate electricity. Wind, considered to be one of the most promising forms of renewable energy available today, presented technological limitations at the Northampton site. By measuring wind speeds at the landfill, which is in a residential area about five miles west of the Smith campus, the students determined that the winds weren’t consistently strong enough to produce maximum power output. Growing biomass crops to be combusted to generate electricity, meanwhile, also had limitations. Among them was that there was not enough soil depth required for the root structure of willow or switch grass plants. Likewise, heavy machinery required for the tilling of the soil might cause possible erosion and soil compaction. That narrowed the focus to solar. In the final months of their project, Holle and Dwyer concentrated on recommending the development of an energy system that, to maximize solar panel electrical output, would rely on photovoltaic panels set on a southern slope and occupying about 19 of the site’s 52 acres once the landfill had been capped and closed. Holle and Dwyer delivered a comprehensive report detailing their findings to the city DPW in May. While the city of Northampton is only in the beginning stages of evaluating those findings and developing a recommendation, the two engineering majors signed off on their part of the project and, only weeks later, donned caps and gowns to graduate from Smith with honors. Holle hopes to start her engineering career with a job consulting on projects having to do with energy efficiency, alternative energies and sustainability. Dwyer received a Fulbright Fellowship that takes her to Kuwait where she will be researching the feasibility of harvesting solar energy as an auxiliary power source to the current electricity infrastructure during power outages. A solar photovoltaic system was one of three renewable energy sources the Northampton DPW asked Smith students Lindsay Holle and Darcy Dwyer to research. The two seniors also set out to analyze the feasibility of wind or vegetation (biomass) for a potential energy system.